Wine Innovations deleveloped this ingenious concept of a single serving wine glasses called The Tulip. Just like a container of yogurt it has a peal-off foil lid. The wine is sealed using patented technology to maintain wine quality and to give a shelf life of over 1 year. 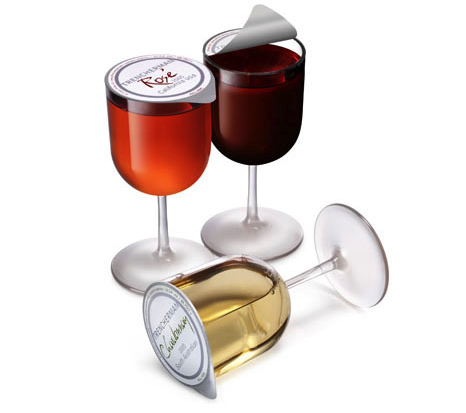 The wine glass are filled with red, white or rose wine and is made from plastic so there are no worries of broken glass. The Tulip is currently sold under ‘The Italian Job’ brand in a Sauvignon Blanc, Sangiovese and Rose. It is also sold under the Marks & Spencer French wine brand ‘Le Froglet’ available in a Shiraz, Chardonnay and Rose. In Germany the wine is sold under the Wein im Glas brand and is available in a Spanish Tempranillo and Rose. You can even peel it back half way and prevent spillage when you happen to bump into the table it rests on because you’re a bit tipsy.